Farlaine the Goblin, a tree goblin shaman from the Forest of Fin-Din, has spent years wandering the very many Oddlands of Wug(hundreds!) in search of a forest to call his own. He only has 10 lands left. He's on this journey with his only friend, his tree Ehrenwort, who's slung over his shoulder and constantly giving him an earful. The story I'm telling is act 3 of their journey. They've been searching for years. They've had a lot of failures. They're a little beat up. We follow Farlaine and Ehrenwort as they wander through the remaining lands, none of which sound promising - The Tinklands, The Saltlands, The Racelands, The Twistlands, The Vaultlands, The Winglands, The Traplands, and more! Farlaine the Goblin is an all-ages book with a fun and quirky sense of adventure, creative and unique from the vast sea of spandex-clad heroes and zombies. 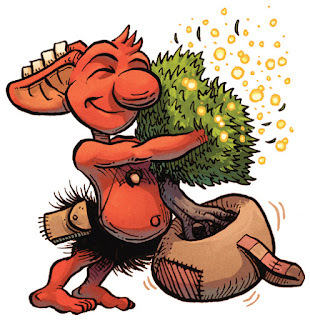 A compelling hero whose adventures tickle the imagination and funny bone as we root for a pudgy little goblin and his tree against overwhelming odds and obstacles. Farlaine gets rave reviews from kids, teens, adults, girls, boys...just about everyone! Farlaine the Goblin is a 7 book series, each book ranging from 35-60+ pages depending on the land and and the story to tell. The goal is always to tell the best story I can.